Before I get to the design plan, I thought that I'd mention the following: 1) Although I was given an "open" budget 😁, I provided a reasonably-budgeted plan by mixing high/mid-range products with attainable solutions; 2) The design was not dependent on major construction updates in order to allow the homeowners to readily execute the plan; 3) The client recently relocated due to a job opportunity, so helping them get settled into their new-to-them home was the priority; 4) While the bay window was begging for a built-in bench seat, the piano was relocated to that space since it was the only area where it would fit. The main goal of the design was to highlight the space's inherent architectural features - which include the fireplace, bay window, and alcove. I also had to come up with a storage solution for books. Note: As a courtesy to this client who paid for design services, product sources are not provided. The fireplace in the client's living room provided a natural focal point. In its pre-existing condition, however, it didn't command much positive attention. So, the solution was to "beef up" the area by applying moldings around the fireplace surround and/or on the entire wall. Moldings are a great way to add character, depth, and architectural dimension without breaking the bank! Opposite the fireplace wall is an alcove that houses a built-in cabinet. I wanted to embrace this feature by painting the area in a contrast color. 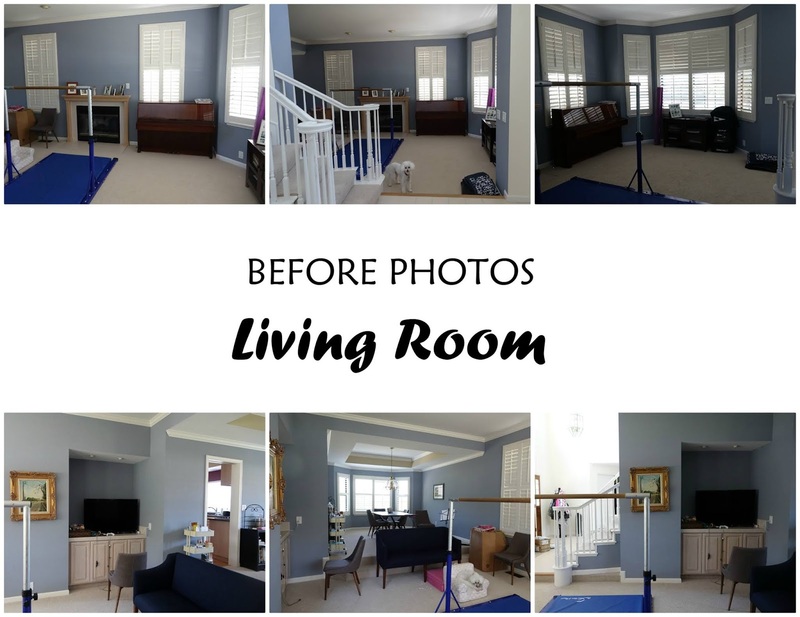 While the living room would be painted a shade of white, the alcove would be painted a deep shade of gray-blue. Floating shelves plus some modern cabinet hardware would complete the nook! Hints of blue, a color the client is drawn to, adds depth to the otherwise neutral room color scheme. Interested in a customized room design?! Feel free to e-mail me for information on design services. Nationwide e-design service is available, as well as local full service design/decorating.